The Potential Dethroning of Bitcoin Market DominancesteemCreated with Sketch. Straight to brass tax. Over the past weeks, it's been rather apparent that the cryptocurrency market was inflating considerably. 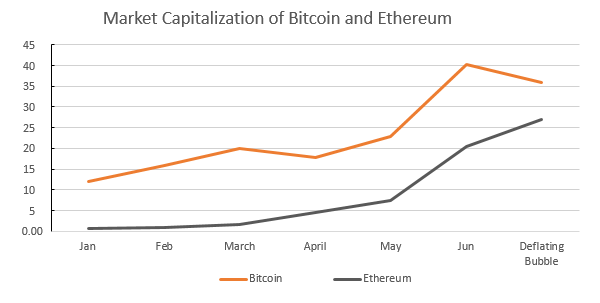 Within a month, bitcoin and ethereum had both increased over 150%. But, with the past two days over, it seems like a considerable amount of the bloat has been burned off. It's been widely apparent that ethereum has been winning over a lot of support, winning the backing of many corporations and investors. But, with bitcoin paving the way of making cryptocurrencies more marketable towards everyday purchases, it seems it might be setting the stage to get surpassed by this eager predecessor. The gap in market capital between the currencies of the past week has been 10 and 9 billion dollar mark. As ethereum has grown more than bitcoin in the past year, it was assumed by many speculators and investment reporters that an ethereum crash would be significantly worse, as bitcoin has more world-wide renown, and obviously... market capital. However, with the plummet of cryptocurrency market cap since June 12th, it seems that the market has chosen ethereum to be quite the contender. Mere hours after the lowest point of the crash, this is where the currencies stand. Can ethereum close the gap? If trends hold strong, there is little that could stand in the way of ethereum passing bitcoin as the dominant cryptocurrency. With a steady growth, as opposed to exponential growth it will be easier to see the outcome. But, as both currencies seem to be uncomfortably growing faster than we can accept their worth, there are more important issues at hand. Let us sit back and watch these two awkward teens develop. I'd love to hear other people's opinion on the subject. It's my first time posting on steem! While on this topic, though, it's fair to say that I'm new to steemit. So, hello wonderful world. I was a bit anxious to get this story out before doing a proper introduction, as I've been working on this story for a while. The fact that steemit approval took considerably longer than I intended coaxed me to get this article out there before and introduction, and I wanted to let this opinion be heard! Thanks a lot, my man. And it looks like the market cap between the two is shrinking as much as ever! Congratulations @jwkellenberger! You have received a personal award!